From innermost to outermost, tiny Atlas (32 kilometers, or 20 miles, across) orbits just outside of the bright A ring and is seen above center in this view. Prometheus (102 kilometers, or 63 miles, across) is visible near lower right. 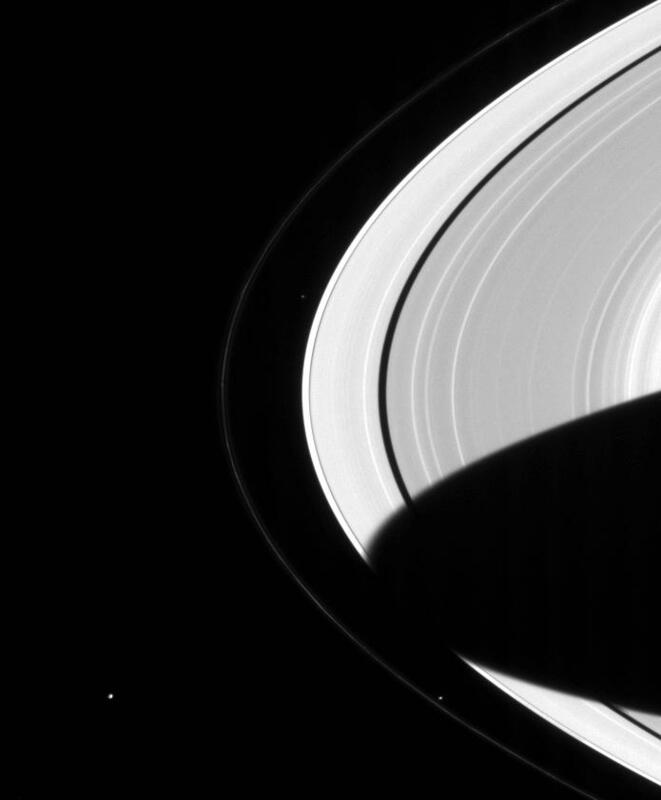 Prometheus and its smaller cohort, Pandora, shepherd the thin, knotted F ring. Finally Janus (181 kilometers, or 112 miles, across) can be seen near lower left. Janus shares its orbit with the moon Epimetheus. 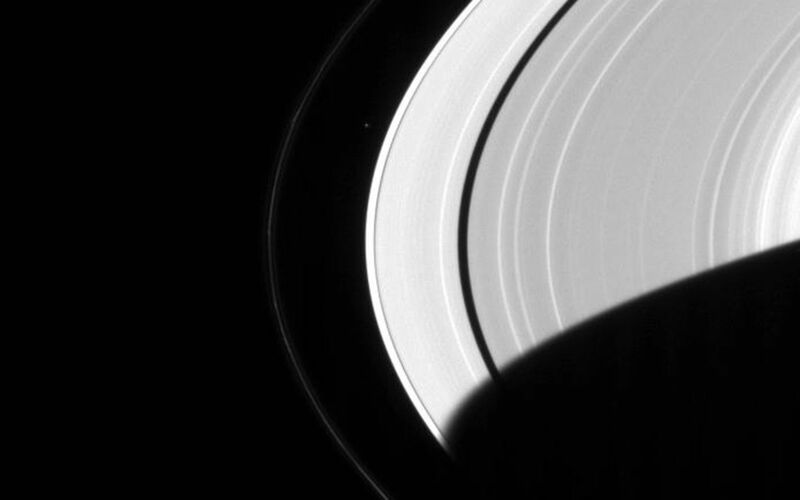 Density waves due to Janus cause some of the bright bands seen in the A ring in this image. Prometheus and Atlas also produce waves in the rings, but their wave regions are too narrow to be seen here. The interactions of the moons with each other and the rings are a major target of study for the Cassini mission. The planet's shadow stretches all the way across the main rings in this view. 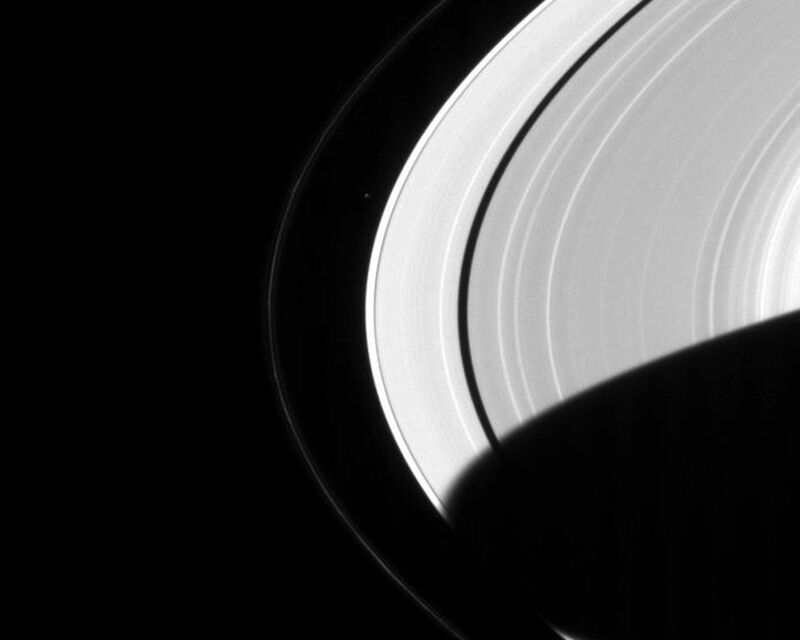 The shadow has an oval shape at present, but over the next few years will become more rectangular as the planet orbits the Sun and the angle at which sunlight strikes the rings decreases. For an example of this from NASA's Voyager mission, see https://photojournal.jpl.nasa.gov/catalog/PIA00335. The image was taken with the Cassini spacecraft narrow angle camera on Oct. 6, 2004, at a distance of 6.4 million kilometers (4 million miles) from Saturn through a filter sensitive to wavelengths of visible red light. The image scale is 38 kilometers (24 miles) per pixel.